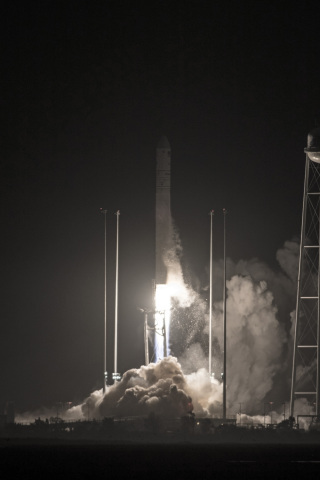 DULLES, Va.May 21, 2018-- Orbital ATK (NYSE:OA), a global leader in aerospace and defense technologies, successfully launched the company s AntaresTM rocket carrying its CygnusTM spacecraft today at 4:44 a.m. EDT from the Mid-Atlantic Regional Spaceport Pad 0A on Wallops Island, Virginia, at NASA s Wallops Flight Facility. The launch marks Orbital ATK s ninth cargo mission for NASA. Following an approximate nine-minute ascent, the S.S. J.R. Thompson Cygnus spacecraft, named in honor of J.R. Thompson, a distinguished leader in the space industry, was successfully deployed into orbit. Orbital ATK s engineering team confirmed reliable communications have been established and the vehicle s solar arrays are fully deployed, providing the necessary electrical power to operate the spacecraft. Watching an Antares launch cargo to the International Space Station is always impressive, said Scott Lehr, President of Orbital ATK s Flight Systems Group. The team works very hard to ensure each NASA commercial resupply mission is successful. Cygnus will be grappled at approximately 5:20 a.m. EDT on May 24. The spacecraft will remain attached to the space station for approximately seven weeks before departing with up to 7,100 pounds (approximately 3,200 kilograms) of disposal cargo. Cygnus s large-volume disposal capability is unique among America s commercial cargo providers and a critical service for NASA. Orbital ATK is proud to once again support the crew on the International Space Station by delivering valuable supplies, equipment and science, said Frank Culbertson, President of Orbital ATK s Space Systems Group. The upgraded avionics and communication system on the spacecraft demonstrate our commitment to increasing the flexibility and versatility of Cygnus to carry a wide range of payloads. We are also honored to name this mission after J.R. Thompson, a pioneer in the space industry and someone who many of us here at Orbital ATK and in the NASA community were honored to call a colleague and friend. Once the S.S. J.R. Thompson unberths from the space station, a NanoRacks deployer will release six cubesats. Upon completion of its secondary missions, Cygnus will perform a safe, destructive reentry into Earth s atmosphere over the Pacific Ocean.